Mens Silver Bracelets are mainly differentiated from Womens Silver Bracelets by the weight and size of the bracelets. The most popular style of Mens Silver Bracelets are the plain silver or stoneless varieties which can be worn daily. 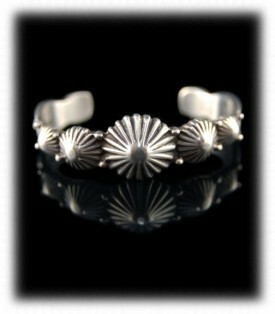 Durango Silver Company has been producing Mens Silver Bracelets here in Durango, Colorado USA for nearly forty years. We have and produce a large selection of Southwestern Styled Mens Silver Bracelets with and without gemstones. We specialize in Silver Bracelets for Men with high quality Turquoise as we own several Turquoise Mines in Nevada and we have collected Turquoise for over 40 years. Mens Silver Bracelets have been very popular with Native American Men since the 1860's and the Southwest has become noted for being a great area to find unique quality Mens Silver Bracelets. Durango Silver Company tries hard to always have a good stock of Silver Bracelets for Men as well as women. Above and to the left is a colorful Mens Silver Bracelet with spiderwebbed Turquoise, it is hand crafted in Silver by Native American Artisan Phil Loretto. This is a contemporary Silver cuff bracelet for men that was made with substantially heavy Silver, well over 1/8th of an inch thick. 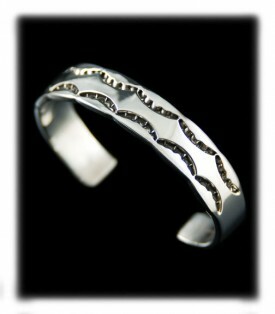 This Mens Silver Cuff Bracelet features a heavy Silver zigzag design of Silver on each side of the bracelet. In the center of the bracelet sets the row of inlaid rich blue spiderwebbed Turquoise that goes all around the bracelet. This is a museum quality Native American Spider Web Mens Silver Bracelet that would be the pride of any gentleman's Silver Jewelry collection. To the right heavy layered braid and beaded wire Silver Men's Bracelet by John Hartman of Durango Silver Company. This one of a kind Silver men's bracelet features hand twisted and beaded wire over diamonds of copper at the center. The inside of the bracelet is textured like sandstone yet smooth which is unique and unusual, the bracelet is very cleanly and professionally constructed. The inner bracelet circumference measures 6 1/2", plus an opening of 1 1/2". The bracelet weighs 123 grams. 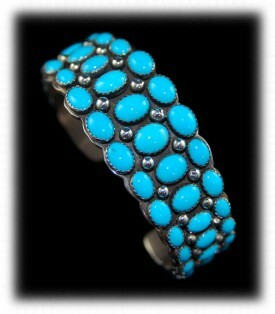 To the above left is a Silver Cuff Bracelet with Sleeping Beauty Turquoise by Navajo artist Patrick Yazzie. This Native American hand crafted Turquoise and Silver Mens Bracelet features sixty, oval cut, natural Sleeping Beauty Turquoise cabochons. 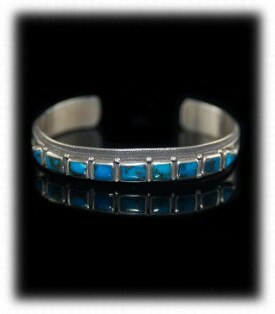 All of these American Turquoise cabochons are set atop a heavy Silver Cuff Bracelet. These blue Turquoise cabochons are the highest grade of natural Sleeping Beauty Turquoise available. 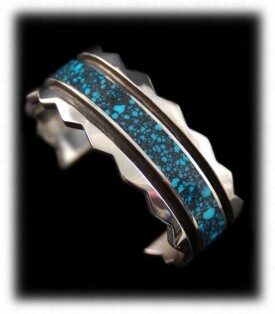 This fine Arizona Turquoise Mens Silver Bracelet is at the peak of contemporary Southwestern fashion. This Mens Silver Bracelet was Native American Artisan Handmade in New Mexico, USA and is hallmarked “Patrick Yazzie and Sterling”. This is a wonderful example of the type of plain silver Mens Silver Bracelets made today. 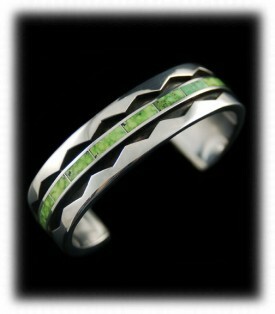 Above and to the right is a hand stamped mens silver bracelet by Native American artist Douglas Craftty. This Mens Silver Bracelet is a piece that could become a main part of your every day style and wardrobe. This Silver cuff bracelet has been hand stamped all around with a scallop stamp design which is very handsome. Silver Mens Bracelets such as this one are very popular in the Southwest and are popular with men worldwide. This is a good example of the type of Mens Silver Bracelets that are sold everyday. To the above left is a classy and quality Mens Silver Bracelet Native American Indian hand crafted in the American Southwest. It was created in Sterling Silver featuring nine deep blue Turquoise gemstones from Bisbee, Arizona. This is a very nice Silver Mens Bracelet that is easy to wear and very attractive in appearance. This is a great example of classic Mens Silver Bracelets made today. Above and to the right is a Silver bracelet for men featuring Carico Lake Turquoise by Native American artist Phil Loretto. This lime green Turquoise Bracelet is without doubt Museum quality. This bracelet features 18 rectangular, lime green, Carico Lake Turquoise inlaid gemstones. This mens Silver Cuff Bracelet features a heavy silver zigzag shadow box design down the middle of the silver cuff bracelet. In the center sets the row of inlay lime green Turquoise that goes all around the bracelet. This Mens Silver Bracelet was Native American artisan handmade in New Mexico, USA and is hallmarked “Loretto and Sterling”. 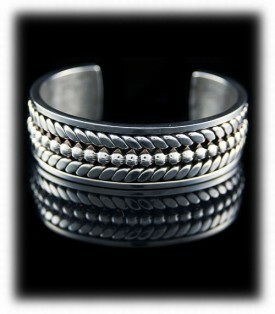 This is a great example of modern Native American style Mens Silver Bracelets being made today by highend artists. We invite you to take a look at a few of our other presentations - Hand Crafted Silver Jewelry, Mens Silver Jewelry and Mens Silver Rings. We invite you to learn more about Mens Silver Bracelets and American Silver Jewelry by following the links in our Learning Center to other informational pages we have written on different topics directly related to Mens Silver Bracelets. In addition, we would like to invite you to join our E-Mail Newsletter - about once every other month we send out a Newsletter to inform our members of what's happening with Durango Silver Company, new products, specials for our members and more. We also have a monthly drawing from our member base to give away Free Silver Jewelry from our company. Please take a moment to become one of our friends by signing in below. We hope you have enjoyed our presentation on Mens Silver Bracelets and have gained some useful knowledge from it.